Happy Black Friday week! Yes, it’s just the week of Thanksgiving again and once again we are looking to share some deals with you, yay commercialism! We’ve delved into Santa’s sack a wee bit early, and we’re proud to offer you – new, seasoned and potential WP Email Capture users – the following deal. 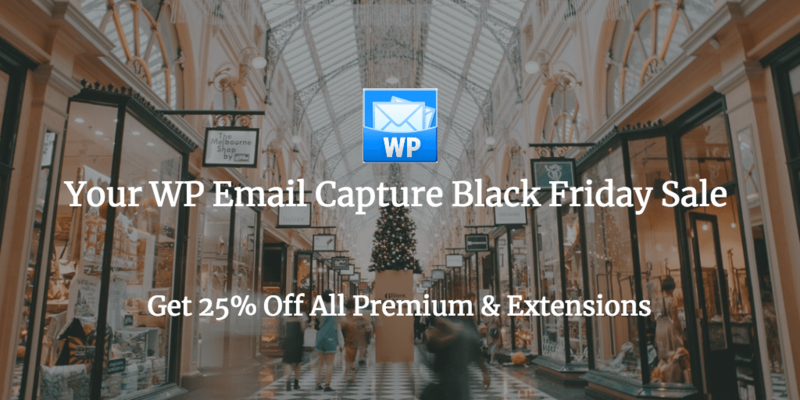 From now until the 29th November, you can get 25% OFF WP Email Capture Premium, or any other extension in our library. All you have to use is the code BF2017 (or click the links below) to take advantage of this offer. Here’s how much you can save. All products come with a years worth of 5* support and updates. Like I said, these deals run until the 29th November. So be sure to take advantage of these deals whilst you can! Any questions, please let us know. Happy Thanksgiving!